All bun cover hairpieces are attatched to a mesh covered, elastic edged dome. The dome has a drawsring running around the perimter that can be adjusted to your desired width. There are also inner combs inside the dome to secure the hairpiece to your hair. These are meant to be worn over buns, but also can be worn over the smallest of pigtails, since the combs inside are so secure. The dome cover on these hairpieces provides the wearer with the fullest looking hairpiece in the industry, even for the shortest of nub pigtails underneath. Hairpieces above shown in Black and 350(copper) mix. These adorable curly bun covers are long-lasting and wearable with either short or long hair. The bun cover dome adds volume, and the interior of the piece has combs. Additional bobby pins can be used to secure the pieces for all day wear. These are not sold in pairs, for a pair, please select 2 of the item. Hairpieces above are shown in black/blue (left), and black/purple (right). Hairpieces shown above are black/burgundy mix. These are super poofy and fun fashion hairpieces. The under layer is a bit longer than the top, the top is styled into a swirled pattern. These come in all natural colors, as well as a few rainbow colors. In the photo, they are worn as pairs, but also can be worn as a single ponytail. Hairpieces shown above are black/purple mix. These are super long and fun natural looking fashion hairpieces. Hairpieces are 18 inches long. The hair is tapered in length from long to short for a natural choppy look. These falls are super full and look excellent as a single hairpiece ponytail as well. These come in all natural colors, as well as a few rainbow colors. In the photo, they are worn as pairs, but also can be worn as a single ponytail. Photo above is shown in two hairpieces color off-black #2. These falls are super silky and are similar to the Anime covers above, but these do not have the shorter portion on the top. These falls are the same length throughout. They are very full and resemble a "bob" cut style when worn. However, the hairpiece can be worn upside down just as easily for a Windy look, like the hairpiece below. Photo above is shown in two hairpieces color Black/red tips. The photo above is two hairpieces of this style worn in the color black #1. This is a very fashionable wet look hairpiece with many layers of flip curls. The whole hairpiece is very full and there is no need to ever brush this piece, since it does not tangle. 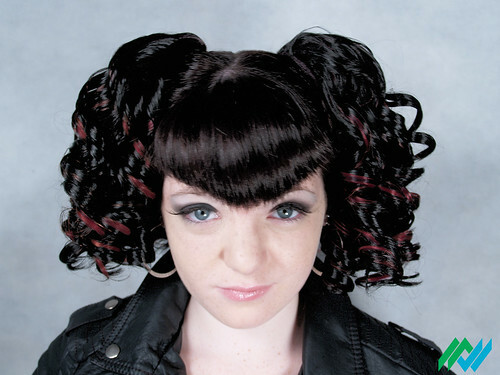 Photo shown above with 2 ponytails in black/burgundy worn upside-down. Black/blue mix on left worn upside-down. Red/black mix on right worn regular way. When worn rightside-up, they resemble the "Silky-bob Drawstring" shown above. These are super high quality and very full. Great for daily wear.